Natural looking colour. Nice'n Easy permanent natural hair colourant. Helps lock in natural looking colour and protect hair between colourings. 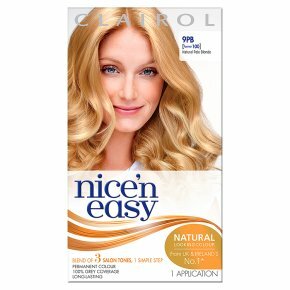 Nice'n Easy provides 100% grey coverage and colour that lasts up to 8 weeks. 100% grey coverage. 9PB natural pale blonde. Do not colour your hair if: - you have a rash on your face or sensitive, irritated and damaged scalp, - you have ever experienced any reaction after colouring your hair, - you have experienced a reaction to a temporary 'Black Henna' tattoo in the past. <br>In case of any reaction or when in doubt consult a doctor before using any hair colour product. <br>Do not use to dye eyelashes or eyebrows. Rinse hair well after application. Avoid contact with eyes. Rinse eyes immediately if product comes into contact with them. Wear suitable gloves. <br>Keep out of reach of children.<br>This product is not intended for use on persons under the age of 16.<br>Temporary 'black henna' tattoos may increase your risk of allergy.<br>Perform allergy alert test 48 hours before use.